To reduce your cost, Brandsport offers this item in Bulk (sold here individually). Gorilla also lists this same item in a 16-piece # 20022SD and 24-piece # 20024SD kit. Gorilla Chrome Small Diameter Tuner lug nuts have a superior seating surface. 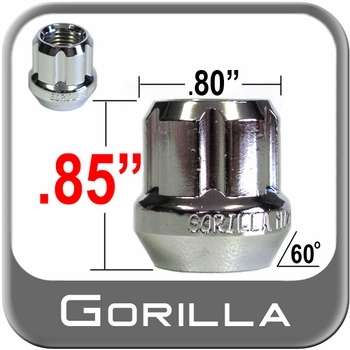 You will appreciate the long lasting quality of the Gorilla Chrome Small Diameter Tuner lug nuts. You will find that a Gorilla Chrome Small Diameter Tuner lug nut torques easily. Give the finished look to your wheels with a new set of Gorilla Chrome Small Diameter Tuner lug nuts.